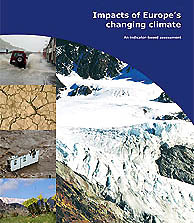 European Environment Agency (EEA) major study about “Impacts of Europe’s Changing Climate,” released on August 17, 2004. At the same time, the National Oceanic and Atmospheric Administration (NOAA) in the United States released the results of a 15-year-long study to measure the total amount of dissolved carbon in the oceans – specifically carbon from rapidly increasing carbon dioxide emissions produced by human industrial activities. NOAA’s startling finding is that between the year 1800 – the beginning of the Industrial Age – and the year 1994, the amount of CO2 being released into the atmosphere and oceans keeps rising exponentially. The world’s oceans absorbed 118 billion metric tons of carbon over that period which is making sea water less alkaline and producing regions of carbonic acid. Carbonic acid can dissolve shells on sea creatures, leaving them vulnerable to predators. Both European and American studies report that Europe is warming up more quickly than the rest of the world. By the end of this century, average temperatures in Europe could climb between 3.6 and 11.3 degrees Fahrenheit because of global warming caused by increasing CO2 and other greenhouse gases. The Swiss Alps are melting so rapidly that by 2050, only one-quarter of the famous mountain ice will be left. The 2003 heat wave in Europe killed at least 20,000 people. If current computer modeling projections are correct, there won’t even be cold winters in Europe by 2080. Summers will be hot and dry with periodic violent storms of heavy rain and hail. New research by the Geological Survey of Greenland and Denmark published this month reports that Greenland’s ice cover is melting ten meters a year – that’s about 33 feet – and TEN TIMES QUICKER than previously expected. Greenland has the largest ice sheet on land in the Northern Hemisphere. The Greenland study suggests that the rate of melting could become faster than the annual snowfall. Some of its ice is nearly two miles thick (1.9 miles) and covers 772,000 square miles. If the Greenland ice continues to melt at its current rapid rate, it will cause sea level rise and flooding around the planet. Graphic Credit: NASA GSFC Scientific Visualization Studio Data Source: Airborne Topographic Mapper. Editor’s Note: A NASA study of Greenland’s ice sheet reveals that it is rapidly thinning. In an article published in the July 21, 2004, issue of Science, Bill Krabill, project scientist at the NASA Goddard Space Flight Center’s Wallops Flight Facility, Wallops Island, Virginia, reports that the frozen area around Greenland is thinning in some places at a rate of more than three feet per year. 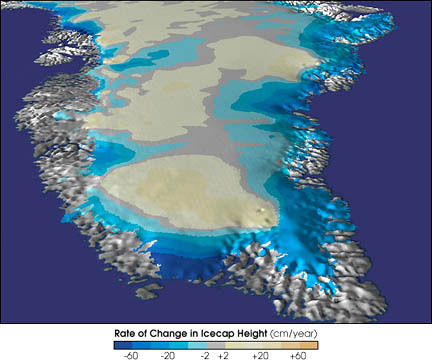 Any change is important since a smaller ice sheet could result in higher sea levels. “A conservative estimate, based on our data, indicates a net loss of approximately 51 cubic kilometers of ice per year from the entire ice sheet, sufficient to raise global sea level by 0.005 inches per year, or approximately seven percent of the observed rise,” Krabill said. Warmer summers, milder winters, disappearing glaciers, rising seas, coastal flooding are not only going to affect human populations. Global warming is already impacting birds around the world more rapidly than expected. 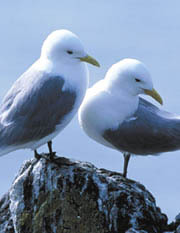 In England, the government monitors sea gulls called the “kittiwakes” to monitor the health of its surrounding sea life. You might say the kittiwakes are like the canary in the cage that miners use deep underground to monitor their air. Scientists monitoring bird populations in the Shetlands and other islands say the number of kittiwakes gulls has declined 50% in the past five years. Now, England’s Royal Society for the Protection of Birds (RSPB) reports that “this year (2004) saw the worst ever (kittiwakes) breeding season in the nineteen years since monitoring began. The gulls have produced fewer young than in any previous year, apparently because of a severe shortage of food.” The Head of Marine Policy at the RSPB said, “We could well be seeing the single biggest change in the North Sea since it was formed 10,000 years ago.” Bird breeding problems go well beyond the kittiwakes. As far north as Shetland and Orkney, other birds such as terns and auks are having breeding problems. 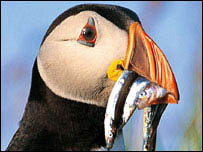 Puffin with sandeel in its orange beak. Sandeels – small fish once so plentiful they have long fed millions of larger fish, marine mammals and sea birds – are rapidly declining in number as well. Over-fishing started the sandeel decline, but now global warming is an even bigger problem. Like dominoes falling, scientists think the food supply problem goes all the way down to ocean plankton where rising water temperatures are causing problems. Plankton is at the base of the ocean food chain, so anything that affects plankton survival affects all sea life. If plankton moves to different sea temperatures – or dies out – then other sea life will have to move, or die out as well. One American ornithologist has been studying the impact of global warming on birds and is worried that extinctions are going to rapidly increase. Dr. Jeff Price is Asst. Professor at the Department of Geological and Environmental Sciences, California State University in Chico. Prof. Price is also Director of the Climate Panel Impact Studies for the American Bird Conservancy. 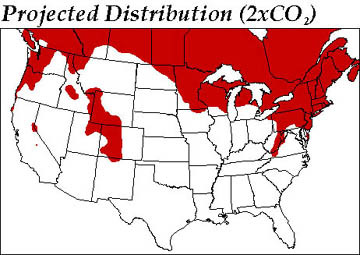 The distribution maps below for green current time and red future by 2075-2100 were produced by Professor Jeff Price. 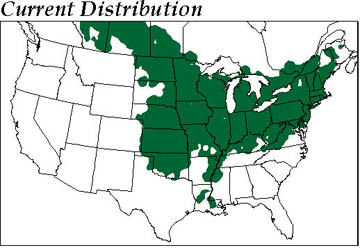 Top green map: Current distribution of Baltimore Oriole. Below red map: Projected more northern future of Baltimore Oriole by 2075-2100. 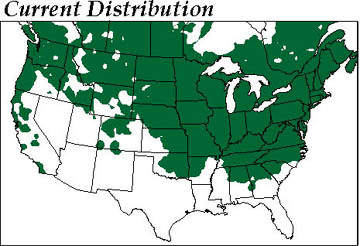 All maps © 2004 by Jeff Price, Ph.D.
Top green map: Current distribution of American Goldfinch. 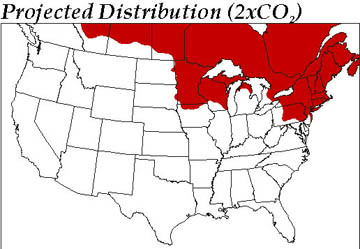 Below red map: Projected more northern future of American Goldfinch by 2075-2100. All maps © 2004 by Jeff Price, Ph.D. I asked him if already-reported anomalies such as the disappearance of 29,000 White American Pelicans this year from the Chase Lake National Wildlife Refuge in North Dakota or large decline in brown pelican populations in California could already be signals of change for birds faced with global warming pressures on habitat and food supplies. Jeff Price, Ph. D., Assistant Professor, Department of Geological and Environmental Sciences, California State University at Chico and Director, Climate Panel Impact Studies for the American Bird Conservancy, Chico, California: “We did find worldwide patterns of change that tie in very well with warming by latitude, especially in the Northern Hemisphere. So you are seeing birds coming back earlier ­ not all species ­ but some species. 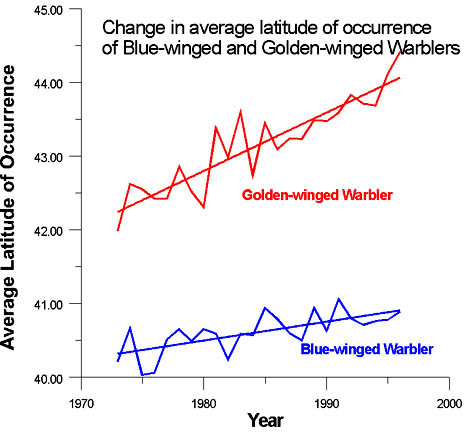 Graphic showing that Blue-winged and Golden-winged Warblers have been seeking higher average latitudes. Graphic © 2004 by Jeff Price, Ph.D.
You’re seeing changes in ranges of birds, changes in ranges of butterflies. You’re seeing some bird populations breeding earlier. So, there are a whole host of biological indicators that show us that for the small amount of warming that has already occurred globally, we are seeing impacts on the Earth’s environment. What worries a lot of scientists are exactly the sorts of things that happened in the North Sea. THAT IS THE LACK OF BREEDING BY THOUSANDS OF BIRDS? In the case of the kittiwakes, it might or might not have had anything to do with the ocean temperature affecting the direct food resource of the kittiwakes. But instead, it could have been the temperatures being enough to impact the plankton. Then the changes in the plankton impact the sandeels and the changes in the sandeels affecting the kittiwakes. Those sorts of linkages are big sources of surprises. They are what we often call non-linear affects and are the reasons that of the people who study these sorts of affects of climate changes on ecosystems, why we all go: ‘Whatever we say ­ some of the models are going to be right and some are going to be wrong ­ but the impacts overall are certainly going to be worse than we think because we don’t understand the linkages very well. They are the non-linear surprises that come about. RIGHT, AND IN THE COMPUTER MODELING HAS ALWAYS BEEN THE BIG QUESTION THAT IF WARMING AFFECTED PLANKTON IN THE OCEANS AND THE PLANKTON EITHER DIED OR CHANGED THEIR POSITION, THEN LIKE A DOMINO EFFECT, IT COULD AFFECT THE FEEDING CHAIN ALL OVER THE PLACE IN WAYS THAT ONE COULD PREDICT AND IT APPEARS THAT IS ALREADY BEGINNING TO HAPPEN IN 2004. I wouldn’t put any money down if I were a betting person until I saw what happens in 2005 or over the next ten years. But it’s the sort of thing like the European summer and all of those people dying. It’s the sort of thing that we’re concerned about and the question is: What’s the probability of it occurring again? WHAT’S THE WORST CASE YOU THINK COULD HAPPEN IN THIS CENTURY AS GLOBAL WARMING CONTINUES IN THESE KINDS OF SHIFTS IN BIRD POPULATIONS ARE FORCED TO KEEP CHANGING? Globally, we are looking at many extinctions among birds, mammals, reptiles, amphibians. EVEN IF WE STOP CO2 PRODUCTION RIGHT NOW, WE WOULD STILL HAVE A CO2 BLANKET AROUND THIS PLANET THAT WOULD CONTINUE TO CAUSE A GLOBAL WARMING TREND FOR MANY DECADES TO COME? Another ornithologist studying the impact of global warming on birds is Dr. Terry Root. She is a Senior Fellow at Stanford University’s Institute for International Studies at the Center for Environmental Science and Policy and Professor of Biological Sciences. Dr. Root graduated from Princeton University in 1987 and has done a major study with Prof. Price of 3000 scientific articles to see data about how plants and animals are being affected by global warming. Prof. Root found that spring events such as migration have occurred earlier by five days per decade over the past thirty years. 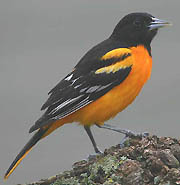 Bird species are moving up to higher elevations and moving further north and south toward the poles. She has also found an overall decline in the water fowl population in the prairie pothole breeding region of northern United States and Alberta, Saskatchewan and Manitoba, Canada. In 2001, there were about 3 million pairs of water fowl that bred there. Three years later, that number has already dropped to about 2 million. Above: map of prairie pothole water fowl breeding region of North and South Dakota and Alberta, Saskatchewan and Manitoba, Canada. 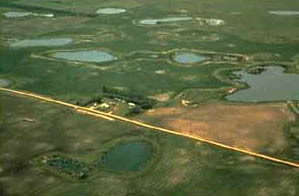 Below: Aerial photograph of a prairie pothole breeding ground. Images courtesy U. S. Environmental Protection Agency (EPA). Terry Root, Ph.D., Senior Fellow, Stanford University’s Institute for International Studies at the Center for Environmental Science and Policy and Professor of Biological Sciences, Palo Alto, California: “If they can’t breed in the prairie pothole region, they over-fly it and go up to the Parklands in Canada. But, they are not able to bring off as many young in that habitat as they can in the prairie pot holes. So, yes there is going to be an overall decline in the population of water fowl. THIS ISSUE OF BREEDING AREAS WHERE BIRDS ARE FAILING TO BREED IS INCREASINGLY A SUBJECT IN THE SUMMER OF 2004. THIS HAS OCCURRED IN THE NORTH SEA. THIS HAS OCCURRED IN YORKSHIRE, ENGLAND. AND YOU HAVE JUST DESCRIBED ANOTHER EXAMPLE. MAYBE EVEN CHASE LAKE IN NORTH DAKOTA FALLS INTO THIS CATEGORY FOR SOME REASON BECAUSE OF THE DISAPPEARANCE OF THOSE 29,000 PELICANS FOR A REASON THAT IS NOT CLEAR. THIS AFFECT ON THE BIRDS’ INABILITY TO BREED, OR INTERRUPTION, THAT CAUSES THEM NOT TO BREED, COULD MEAN THAT A LOT OF SPECIES COULD DECLINE. That’s right. The study I was telling you about was a projection for the future. This would be in 2050. It hasn’t happened thus far, but the possibility is there. WOULD THE BREEDING PROBLEMS IN YORKSHIRE, ENGLAND, AND THE NORTH SEA REGION, BE THE FIRST SIGNS OF ONGOING BIRD DECLINES IN THE FACE OF GLOBAL WARMING? There certainly are changes being seen in all different taxa of species around the globe. The thing I’m most frightened about ­ there are actually two things. One is that the warming, that species are going to react in very different ways to warming. So one species is going to be moving northwest, one species is maybe going to be moving northeast; one species may not be moving at all. So, what could happen is that the communities of predator and prey or the competition ­ the species that are competing in these different communities ­ those interactions are going to be thrown off because the community is going to be torn apart. Some species will be moving and their prey may not be moving with them. That’s going to be very detrimental to the predator. If the predator moves out of the way, then the prey can increase in population and that can be very devastating to the population. In some situations, a bird will be feeding on a particular insect and that insect might be emerging earlier in the spring because it’s warmer. But the bird is not arriving on migration because instead of being triggered by warming, it’s being triggered by day length. Then when the bird gets there, the insects have all emerged and there is a dirth of prey for the birds to eat. WITH THIS ISSUE OF THINGS CAREENING OUT OF BALANCE, WE DON’T REALLY KNOW WHERE THIS IS GOING TO END UP BECAUSE WE HAVE NEVER BEEN IN A SITUATION LIKE THIS BEFORE AS HOMO SAPIENS. That’s right because the change is so rapid. The species are having to adapt in such a fast time period that we really don’t know how they can adapt. The other thing that is going to happen is that even if we stopped CO2 from being emitted now, we would still have a lot of sea level rise because of the heating of the water in the oceans.